You’re getting there! Hold on tight…things are about to get fun! And by fun I mean you’re about to test the limits of what you thought your bladder could handle. I could live without the glamorous tests of my bladder. I think I put that organ through enough when I refused to use the outhouses at Girl Scout Day Camp! 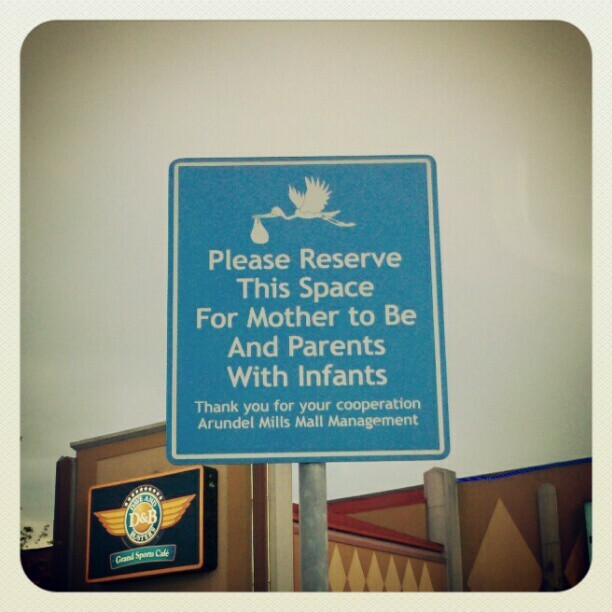 Every time we go into a parking lot, I ask “Where’s the pregnant lady parking?” And if they don’t have it, I swear. A lot. And I don’t think we’ve ever really been to a place that has it. Motherbitches is a fabulous first word! Work on that for sure! I am also totally lazy so the fact I hadn’t ever taken advantage of these spaces yet sort of appalls me. I can’t believe we only have pregnant you for another 3 months! You better not abandon us for that %^#1&@! baby! Loving the post as always. Abandon you?! I could never! Think of all the rants that will come WITH baby. It can only get bigger and better from here! I’m glad I”m not the only one downing pineapple as the flavor of choice right now. 🙂 I am envious of your ability to wear high heeled shoes – I’ve been donning not-so-pretty flip flops for weeks now. Fun when winter isn’t quite done with us yet here in Canada. Also reserved parking rocks. Though in our area I haven’t been able to use it once because the spots are always taken by the elderly. I would feel horrible asking little old ladies with canes to move but part of me wants to scream and point at the other reserved spots that are there for them and would they please leave for my waddling self? But I don’t because old ladies and such. Yeah.